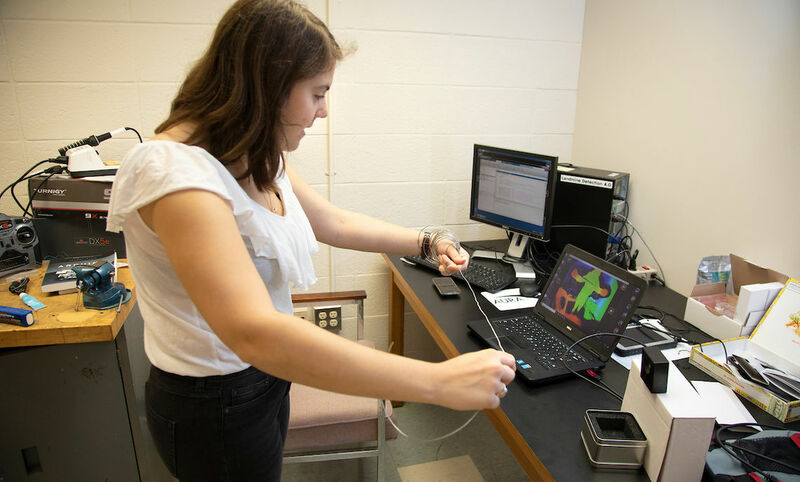 In a quiet room in Franklin & Marshall College’s Hackman Physical Sciences Laboratories building, senior Gabriella Sallai stands at the intersection of physics and geoscience as she works on a critical aspect of a robot designed to detect land mines without endangering the lives of humans. Her work as a summer Hackman Scholar involves testing a laser and a “flight-of-time” camera for the four-wheeled robot. The camera uses pulsed light signals that bounce off objects in the machine’s path to determine their size and distance. “We have a very high-powered laser that the Department of Defense gives to soldiers to use, and it’s supposed to detect trip wires so we’re going to see if it actually does that,” she said. Sallai, a physics and women’s and gender studies joint major, plans to study engineering when she graduates. The project she is working on is “largely an engineering project,” said F&M’s Associate Professor of Astronomy Fronefield Crawford. Working with Tim Bechtel, director of F&M Science Outreach and associate teaching professor of geosciences, Sallai will help test the equipment to ensure the robot can effectively navigate the deadly terrain without getting destroyed. “The data will be used to navigate, to avoid obstacles, to ‘sharpen’ the robot’s holographic radar images, and hopefully, with the assistance of a powerful line laser, to provide detection of trip wires that are often used to trigger mines or IEDs (improvised explosive devices),” Bechtel said. The robot in question is in Florence, Italy, where an international team, including F&M researchers Bechtel and Crawford, has been developing it. As part of her research project, Sallai attended a conference in Switzerland focusing on ground-penetrating radar, where Bechtel and other members of the Italy-Ukraine-U.S. collaboration presented papers. 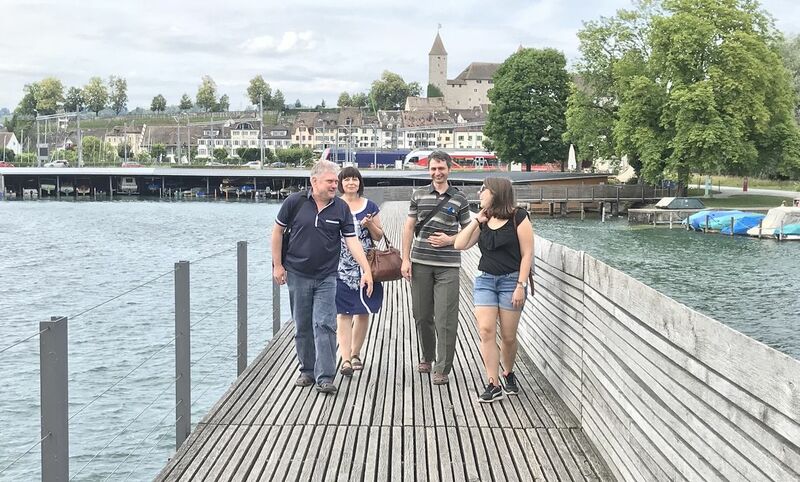 As part of her research project, Sallai, right, attended a conference in Switzerland, where F&M Professor Bechtel and other members of the Italy-Ukraine-U.S. collaboration presented papers. During the conference, the researchers used an iPad – a cell phone is also applicable – to operate the robot in Florence. They moved it around a sand test bed as its holographic radar scanned and successfully detected a hammer the engineers buried for the demonstration. For Sallai, who spent part of her summer in Florence working on the robot, her research is applicable to her future career.